Sonic Mania is a return to the classic game's roots. While those sentences have probably been uttered before, the latest trailers and screens for the game confirm this is a true to life sequel from the very first Sonic The Hedgehog game on Sega Genesis. Here's how Sega describes the game. Sonic Mania celebrates the best of Classic Sonic, pushing the envelope forward with stunning 60 FPS gameplay and pixel-perfect physics. Play as Sonic, Tails and Knuckles as you race through all-new Zones and fully re-imagined classics, each filled with exciting surprises and powerful bosses. Harness Sonic's new drop dash, Tails' flight, and Knuckles' climbing abilities to overcome the evil Dr. Eggman's robots. Discover a myriad of never-before-seen hidden paths and secrets. Clearly the game is a fan service and the reveal of the $60 Collector's Edition matches up with that ideal. I'm in. 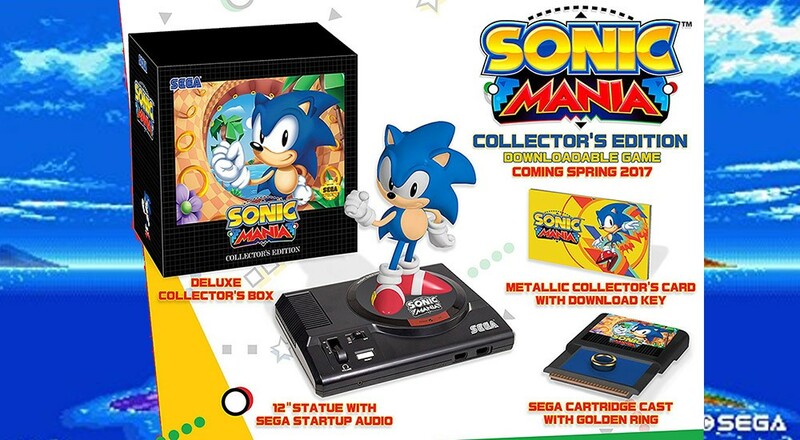 You can snag the Sonic Mania Collector's Edition from Amazon right now at a discounted rate. The game will support two player co-op just like Sonic 2. It'll be out on Xbox One, PC, PlayStation 4 and Nintendo Switch on August 15th. It'll be available digitally for $19.99. Here's a video of some gameplay of Tails to hold you over until then.